Yesterday, Christian Kohlhaas, Matt From College Station and myself drove from our respective cities in Texas and visited Eddie The Collector (also known here as Victrolajazz) in Waco, Texas. As Eddie mentioned in the update, the overhang in the background is from the old Kress five and dime store and is still intact. 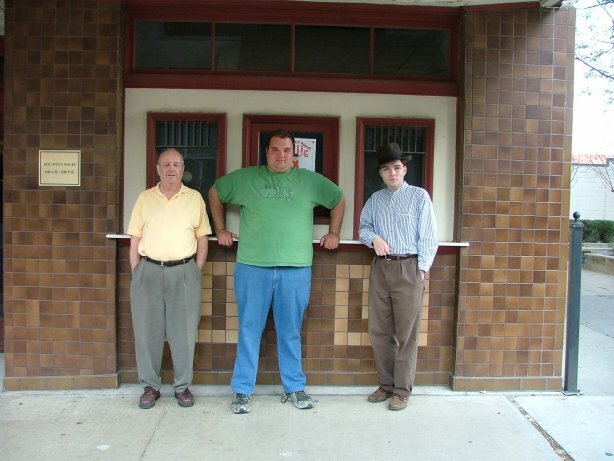 We thought it would be kind of fun to go back to more or less the same exact spot some 70 something years ago and recreate the photo with Eddie filling in for his father and with Christian filling in for the other man in the photo. Unfortunately, after we went out to eat and made it to downtown Waco, we realized that we forgot to bring a copy of the original photo with us. So we were not able to recreate it from the exact camera angle with Eddie and Christian in the exact same poses. But we were able to come up with more or less the same spot give or take a few yards. It looks to me like the overhang on the Kress Building has probably been shortened a bit over the years. Also, it is pretty clear looking at the two photos that the original was taken from a much lower angle. In the original, the Waco Hippodrome sign can be seen to the right of Eddie's father's elbow. In the modern picture, the spot where the sign is (obscrured by trees) is over Eddie's shoulder. 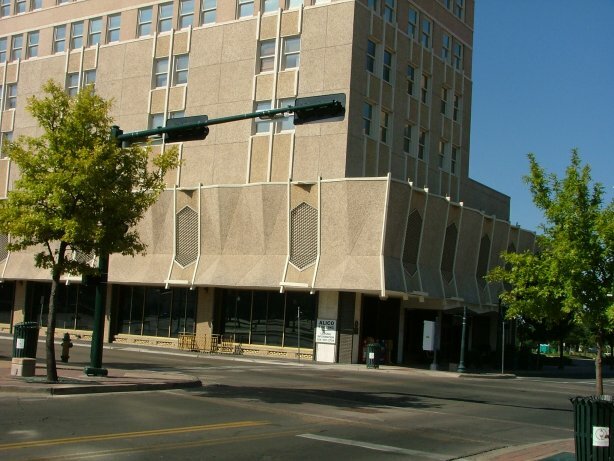 Here is a picture of the Kress Building from across the street. The Kress dime store chain was very big back in the early 20th century and was famous for the architectural quality of its stores. The company actually had its own in-house architectural department. 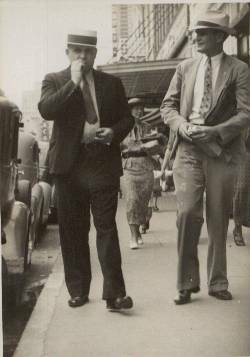 Because the name "Kress" sounded so similar to that of another dime store chain, S.S.Kresge (which later became Kmart), the two companies made it a point not to operate stores in the same cities. 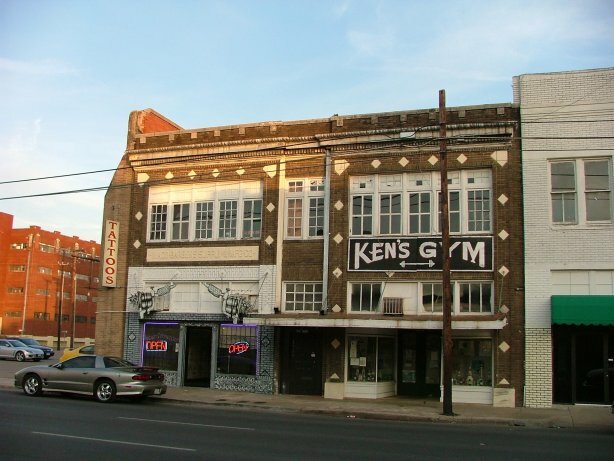 The 1930s Kress store in Fort Worth is still standing and it is an art-deco beauty. This Waco store is pretty modest compared to some of the Kress stores in other cities. The facades of the buildings to the right of the Kress have obviously been "modernized" in more recent decades. 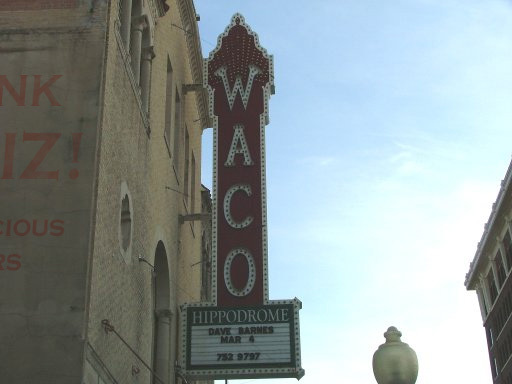 Here is a picture of the sign in the front of the old Waco Hippodrome theatre which started out as a Vaudeville House and is barely visible in the vintage photo. Before Eddie, Christian and I went to downtown to recreate the photo, we stopped for lunch at the Elite Restaurant which has been in business since the 1920s and has operated out of the same building on Waco's old traffic circle since the early 1940s. 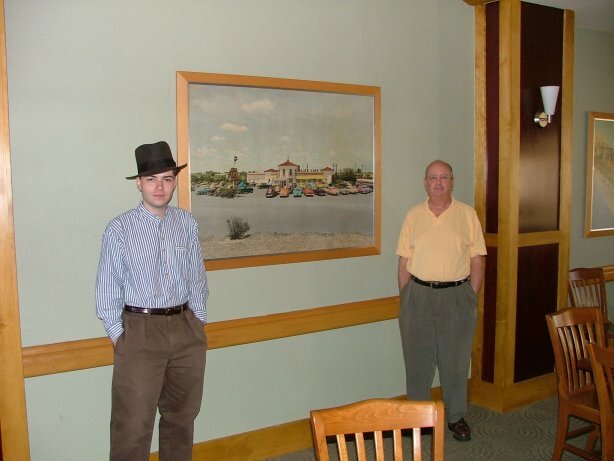 Above is a photo of Christian and Eddie with a painting of the restaurant between them. 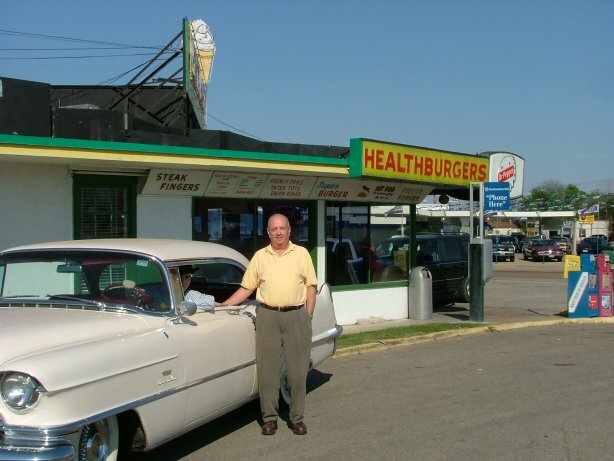 This is an old drive-in restaurant located next door to the Elite and has been in business since 1949. 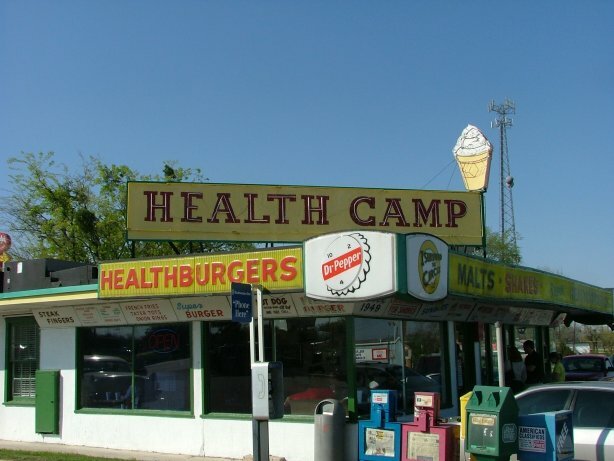 The name of the place and how they describe their hamburgers cracks me up. We made out trip from Eddie's house to the traffic circle and then to downtown in Eddie's 1956 Cadillac. It is a VERY neat car. It even has air conditioning and power windows. It does not have seatbelts, however. It feels VERY odd for someone of my generation to be riding in a car without seatbelts. In this photo, Christian is at the wheel with Eddie standing outside. 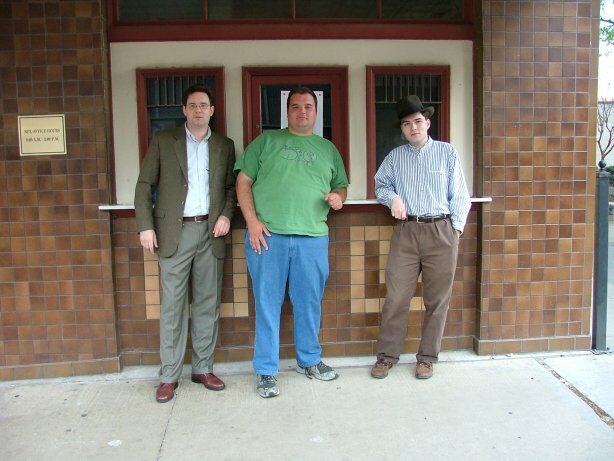 After we did the recreation of the old photo, Eddie, Christian and I visited the Dr Pepper Musueum in this building near downtown Waco. My camera batteries died right when we got to the museum so I am using a photo I took of it in September 2005. Dr Pepper got its start in Waco, Texas at the Old Corner Drugstore. 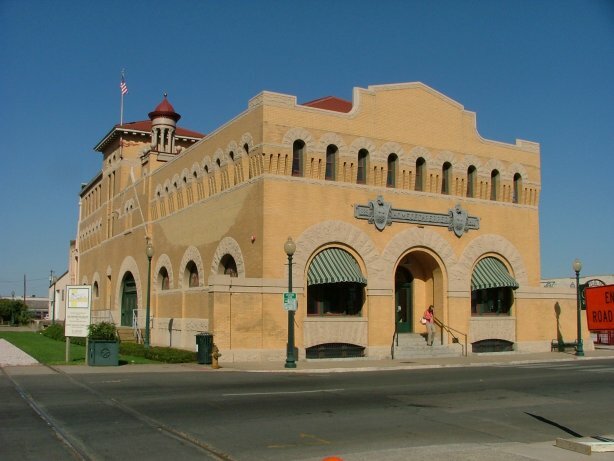 This building was built in 1906 and was the main bottling plant and, I am pretty sure, Dr. Pepper headquarters before the company relocated its headquarters to Dallas in 1923. Lots of very interesting old artifacts about soft drink history are on display here. The lighter colored bricks on the building are those that had to be replaced when the building was heavily damaged by the 1953 tornado that hit Waco. After we finished visiting the museum and made a run to the store for new camera batteries, we explored some of the surviving old buildings in downtown Waco. Waco's downtown was hit very hard by a 1953 tornado which killed 114 people and it has never really recovered. Most of its old shop fronts are empty or boarded up. But enough grand old buildings survive that it has the potential to make a comeback and be a really nice place again. Here is some detail work on the upper portion of a two story commercial building. The ground floor has been totally botched up by various ugly "modernizations" over the decades. 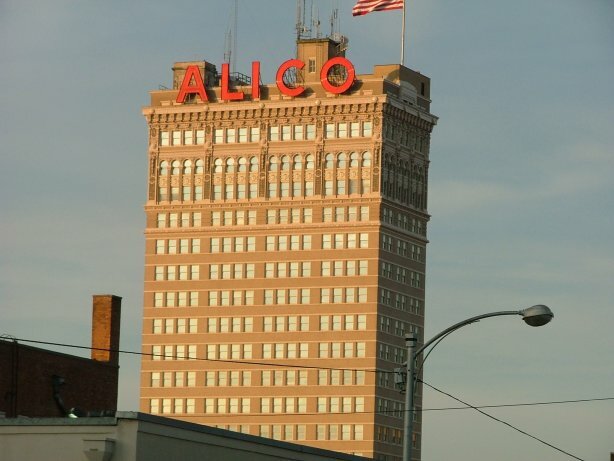 Waco's tallest building is the ALICO building which was built by the Amicable Life Insurance Company in 1911. The company still operates out of the building. For a while it was the tallest building in the entire Southwest. The ALICO was hit by the 1953 tornado. The building across the street collapsed and was where most of the causualties occured. The ALICO withstood the tornado with hardly any damage - it merely swayed back and forth. Here is a photo I took in September 2005 of the detail of the ALICO Building's upper floors. 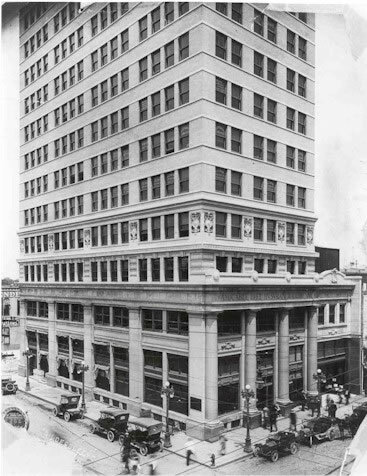 The base of the ALICO Building once matched the rest of the structure. Unfortunately, while the building was able to survive the very powerful tornado of 1953, it was not left undamaged by the era of aesthetic vandalism known as the 1960s. 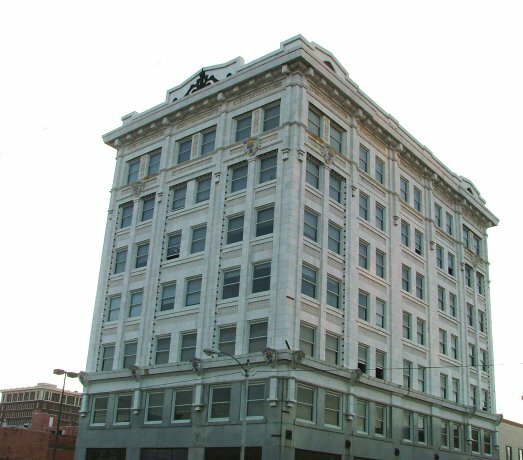 The building's lower floors once matched the rest of the structure. This picture shows what was done to the building in the early 1960s in an attempt to make it look "modern." 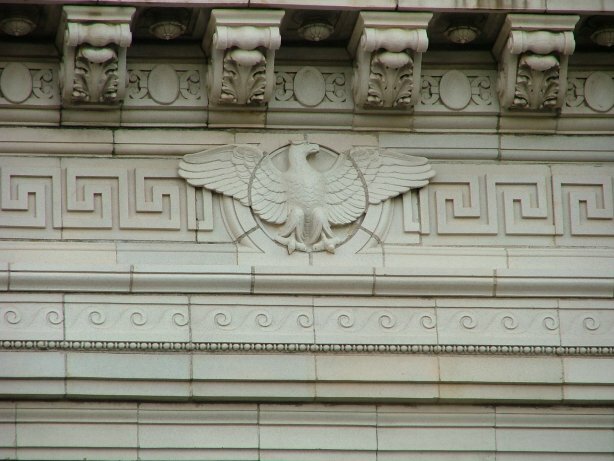 A similar act of aesthetic vandalism was also done to the building's once ornate lobby. 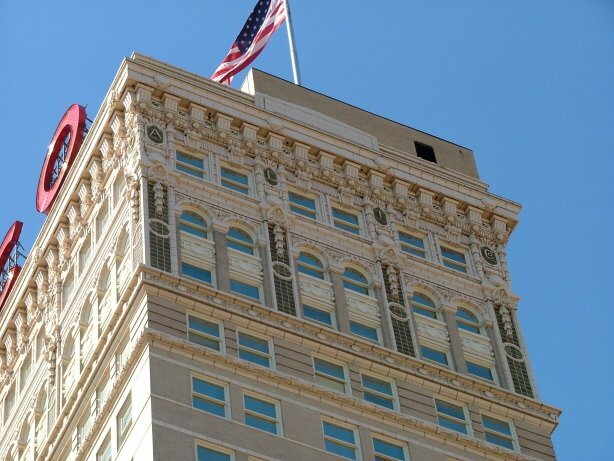 This is the old Praetorian Building in downtown Waco. Here is an old commercial building that I think would be nice to see restored and put in a somewhat........shall we say "upgraded" usage. Matt From College Station was able to meet up with us before we left downtown. In the picture from left to right: Eddie, Matt, Christian. From left to right: myself, Matt, Christian. I know, I look like I just saw a ghost or something - but in the other photo we took with me in it, I had a REALLY bizarre expression on my face so this one will have to do. After we finished exploring downtown the four of us headed back to Eddie's house where we listened to 78 rpms on his Orthophonic "Credenza" model windup Victrola and watched some really neat early 1930s musical short features and a fun 1930 Jeanette MacDonald / Jack Oakie movie Let's Go Native. Thanks Dismuke... What a great Waco photo journal; I'd love to see more of this happening on the board. It's such a great way to "meet up with" the Dismuke community. I really love your term, "aesthetic vandalism" -and that modern base of the Alico building has got to be the absolute prize winner example of it-BLECHH!! It looks like you guys had a fun day in Waco -where to next? It did, however, have the period in the name prior to 1950. One of the things we did at the Dr Pepper museum is have Dr Pepper sundays. That consists of a scoop of vanilla ice cream with undiluted Dr Pepper syrup on top. It probably sounds horrible - but it tastes wonderful. The syrup by itself has a taste that is somewhat different than in the soda. We had our choice of having our Dr Pepper sundays with modern Dr Pepper syrup or Dublin Dr Pepper syrup. We, of course, had the Dublin syrup. 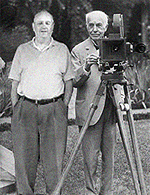 We will probably meet up again in Houston in early April when I will be down there to record the special broadcast with Kurt Nauck. I was thinking about perhaps opening the get together to the public as I will have my audio restoration equipment down there. It might be kind of fun to have a get together where Radio Dismuke listeners and local collectors can meet and those who are collectors can bring some of their records and take turns playing them. It doesn't look like I will be able to find a location where I could set up my audio equipment where everyone can meet in time for my going down there, however. Perhaps we can do that some other time. It did, however, have the period in the name prior to 1950. "Dr. Pepper came into being in 1885 in Waco, Texas. According to legend, the drink was mixed by a young counter man at Wade Morrison's Old Corner Drug Store and was given its name in order to win approval from the owner. 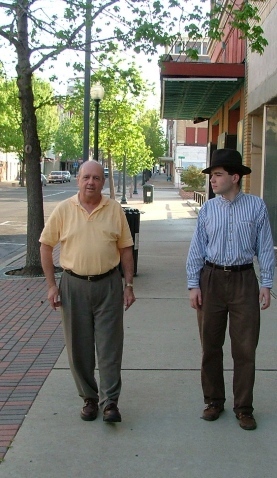 Morrison had come to Texas after being fired from a pharmacy in Virginia because he fell in love with the pharmacist's daughter. His Waco customers heard so much about his broken romance that they named the soda invention for the Virginia pharmacist, Dr. Pepper. The final formula for the drink was perfected by a local ginger-ale bottler named R.S. Lazenby after two years of experimentation. 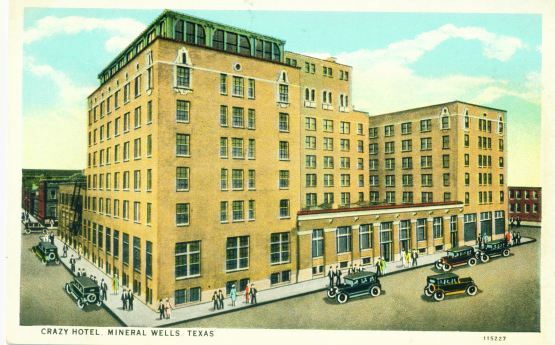 The drink remained a Texas regional specialty until the 1920s, when the company broke into larger territory with an advertising campaign pushing the drink as a between-meals energy source. The slogan, "Drink a bite to eat at 10, 2 and 4 o'clock," gradually shrank down to a mysterious "10,2, 4" on the bottles. The memorable "I'm a Pepper" slogan of 1978 came from the advertising offices of Young & Rubicam." Speaking of soda history - at the Dr Pepper museum is a section devoted to various Dr Pepper knock offs that been around over the years. Most of them are store brands such as "Dr K" for Kroger. But, of course, there is also Mr Pibb which was its own brand as is Dr Wells which I have occasionally run into. However, what really caught my attention in the exhibit was the fact that they had an empty bottle and an empty can of Dr. Nut. Dr. Nut was a regional soft drink made and primarily sold around New Orleans, though it did show up in other parts of the country. It has apparently not been made for a number of years now. Anyhow, those who have ever read John Kennedy Toole's incredibly hilarious novel A Confederacy of Dunces, which was set in New Orleans, will recognize Dr. Nut as the soda pop that the main character Ignatious Reilly was extremely fond of. I always thought Dr. Nut was just a purely fictional version of Dr Pepper. Even after I saw the bottle and can in the exhibit, I felt the need to do a web search on the product just in case what I saw in the museum was some sort of prop from a movie version of the novel which I understand was either once made or in the planning. They turned out to be very much real. Too bad they don't make it any more - I would like to try some. "Early Dr. Nut advertising featured a man on the beach, dressed only in half a nutshell as a bathing suit, with a squirrel as his companion"
"Later, in the 40s, Dr. Nut was better dressed in a checked suit wearing a monocle and a straw hat with his squirrel on a leash"
Oddly enough, here in Texas one can actually buy Dr Brown's Cel-Ray Soda at some of the Wal-mart Supercenters. 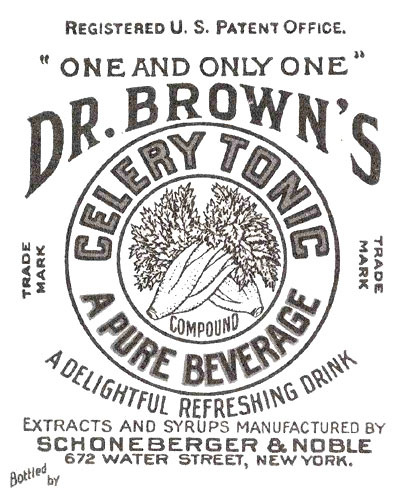 At one time, the drink was hard to find outside of the New York City area. Very good stuff. Moxie happens to be my all time favorite soda pop. I LOVE that stuff - but it is definitely an acquired taste. The first time people drink it, they usually have a look of stunned disbelief on their face. I remember the first time I drank it - I thought it was horrible. But it sure quenched my thirst - and I eventually became addicted to it. Sadly, it is primarily sold in the New England area. There is a specialty soda company that does bottle it for sale elsewhere - the same people who make that cherry cola with the Moxie name you are talking about. That company bottles Moxie as Moxie Original Elixar. In New England, it comes in orange cans and 2 liter bottles and there is even a Diet Moxie which I have yet to try. A couple of years ago, Cost Plus World Markets - an import chain - started to carry the specialty bottling company's version of Moxie and I would buy out the entire stock in the store near my house every time I saw it there. Despite the fact that they always sold out of it, they discontinued it after a year. They said that they routinely change out the merchandise they carry to keep the store interesting. I have since finished up the last bottle in my stockpile - and I very frequently get a big time craving for a bottle of Moxie. I wonder if there is a way that I could buy the syrup and make my own with regular soda water. One can make a sort of pseudo-Moxie by taking regular rootbeer and adding Angostura bitters to it - but it is not quite as good. In my package collection, I own a large bottle (60 oz?) of original formula Moxie -when I say original, I mean original - My specimen is most likely from the late 30's based on the bottle design and label ... and it has never been opened. I would be reticent to let you take a swig from it because it would probably destroy your passion for the stuff instantly (if you could taste the difference that is :-) ... and it would also KILL YOU !! 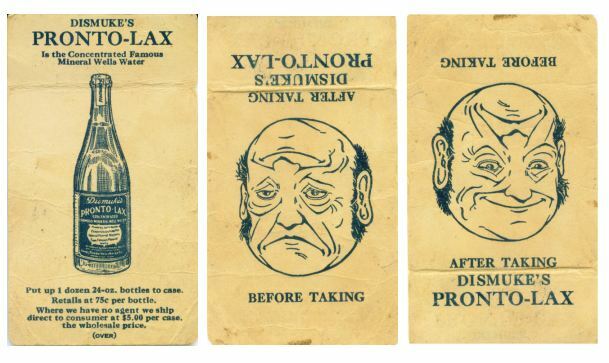 Moxie got its start as a medicinal drink back in 1885 when it was first introduced by the Moxie Nerve Food Company based in Lowell, Massachusetts. Yes indeed, living in New England, I am very familiar with Moxie. I believe the doctor who concocted it was born and raised in Maine, but found his way to Massachusetts in later life. I remember the Moxiemobiles with life-sized white horses mounted on the back. They were used in parades and were well-known icons of the company. There is still one in existence somewhere in the Portland area and it periodically makes its appearance on special occasions. Of course, those were the days when each pupil's desk held an inkwell and paste came in a huge glass jar. Perhaps a few classmates had sampled the ink at one time or another. I know for a fact that the paste was sampled on more than one occasion. The teachers would place a gob of paste on a piece of paper and hand them out to each child for art projects. The checkerberry aroma was much too tempting and many found it to be "finger licking good". I never remember any harm being done by ingesting the stuff, but today it would be cause for panic and a trip to the emergency room for sure. I have to say that I acquired the taste for Moxie as I grew up, but it has never been one of my favorite drinks. 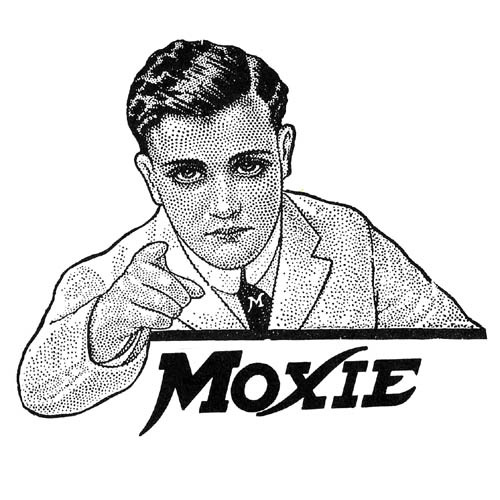 Yes indeed, living in New England, I am very familiar with Moxie... I never remember any harm being done by ingesting the stuff, but today it would be cause for panic and a trip to the emergency room for sure. Those are WONDERFUL memories; Thank you so much for sharing them with us... So, to summarize, one of Moxie's advertising slogans should be: "We're not making claims that Moxie will delight you as much as eating school glue, but it is still a very tolerable beverage -one that inspires school children to sing!" I have never heard of "checkerberry" before. I googled it up - it's another name for "wintergreen", one of my favorite flavors for ANYTHING -chewing gum, breath mints, toothpaste, school glue -you name it. One of my favorite old-timey sodas is Boylan's Birch Beer (from New Jersey) which has a very distinctive wintergreen accent. The checkerberry fruit is the source of wintergreen oil. Other synonyms for it include "boxberry", "teaberry" and "spiceberry"... not to confuse matters. Anyway, I can see now why that paste was so irresistible. I never heard that song before. Hmmmmm. Perhaps I can go to the office supply store and buy a bottle of fountain pen ink and get my Moxie fix that way. What color do you think tastes best? Perhaps it would be better if I got washable blue instead of permanent black. Some years ago I made a visit to New England and went to a supermarket specifically to purchase some Moxie. I noticed that they had a generic store brand of a soda pop called "birch beer" which was clear like water. I have had root beer, of course, and I love a good Jamaican ginger beer but I had never heard of birch beer. So I bought a bottle of the stuff. When I drank some my reaction was "blccchhht - this stuff tastes exactly like carbonated Pepto-Bismol." I couldn't believe that anyone would actually drink the stuff (but then again, that's what people sometimes say about Moxie, too). After some thought it occurred to me that birch was probably once a very popular flavoring. I'll bet when Pepto-Bismol first came out lots of people said: "Gee, this new medicine tastes great - it tastes just like birch beer." Today, birch is no longer a popular flavoring so when people try birch beer, the one frame of reference they have to associate it with is Pepto-Bismol. I remember reading an article in the paper a few years back about the difficulties that the Dr Pepper/Seven Up company was having trying to revive the Seven Up brand which has declined significantly in market share compared with Coca-Cola's Sprite. The biggest problem they had was the fact that when they surveyed people under a certain age about what they associate with the Seven Up brand, the overwhelmingly most common reaction was it reminded them of when they were sick as children. Of course, Seven Up along with ginger ale and chicken soup was something that lots of people for years have given their kids when they were sick - presumably because it was a pleasant way for them to stay hydrated and was not as harsh as colas. Can you imagine being in charge of reviving the image of a brand that most people associate with being sick? Part of the reason for the paste consumption may have been due to the fact that some of the children came from deprived homes and were sent off to school without breakfast or lunch. The paste may have been a good "stick to the ribs" substitute. It was not always due to poverty, however, as one of my classmates was the son of a prominent physician and I'm certain he never lived below the poverty line. I swear, that boy would have been the top contender had there been a prize awarded at the end of the school year for the student ingesting the most paste. I wonder if the good doctor ever found it puzzling as to why his son was often constipated. As for the ink, it always came in black and the inkwells frequently sprung leaks, soaking into the contents of the desk below. Many a book and precious artwork were ruined by such misfortunes. I guess I am dating myself by referring to wintergreen as checkerberry. I remember Wrigley's teaberry gum, which is one and the same and was my very favorite. As kids, we used to go romping through the woods collecting May Flowers and various plants. The bright red checkerberries were a prized find and were most flavorful to chew on, as well as the leaves of that plant. Ah yes, and birch beer was also a very popular beverage, especially in my mother's days and she was very fond of it. Thank you, Dismuke for posting the Waco photos. Very interesting and it is also very nice to be able to put faces to the names now. 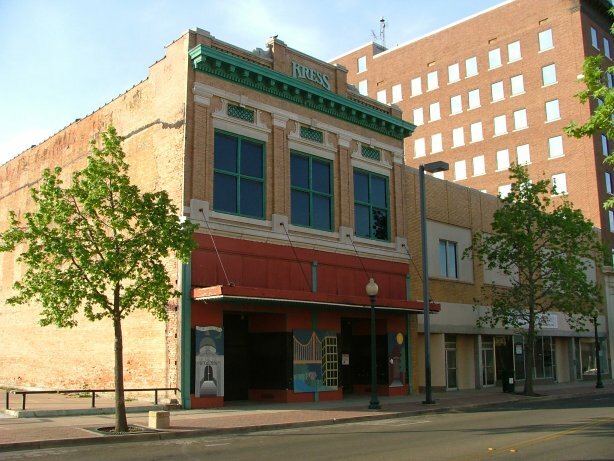 Wait a minute... Take a closer look at that Hippodrome Theatre in Waco. Is that what I think it is painted on the side of the building? ... Yes, it looks like it might be an old "Drink Friz!" sign left over from the 50's... Imagine the nerve of the Friz Bottling Company for advertising their product right in the heart of Dr Pepper City!?? Are you kidding? Both Dr Pepper and Moxie were invented in the same year (1885) on opposite sides of the country? Did anyone else notice this? 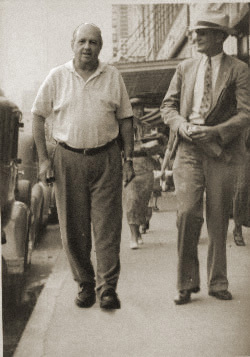 Hey, I just found another photo of Eddie the Collector in Waco -this time taking his father's place in the early 30's ! 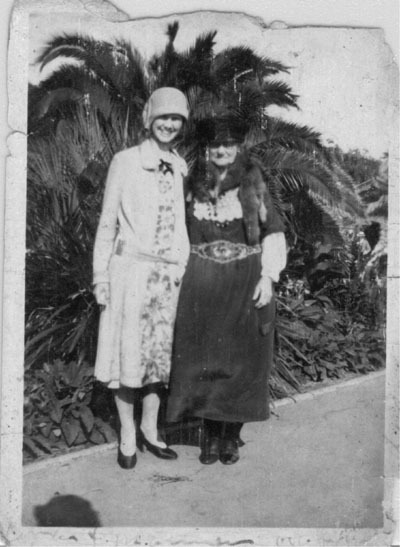 Methinks you are doing the magic with "Photoshop"
...I've enjoyed spending a day here in 1934, 'tho it's been a bit Depressing. I've got a better idea -Let's send you back to Menlo Park! All your photos, Dismuke, look like YOU are the one taking the pictures all the time. It keeps your mysterious lure. ...A man with one name, who's voice we hear, and we only can imagine what you look like! When are we going see a photograph of Dismuke? Great photos, by the way. I love that you call what was done to those beautiful old buildings in the '60s, "Architectural Vandalism"!! That's perfect! Why did they feel that they have to "modernize"? It's a shame that they didn't appreciate what they had to begin with. The original is far better. The Hotel San Diego is a great biding from about the same era that was archetypal vandalized much in the same way. Now they are tearing it down completely. It's very sad to me. The Army put me up there when I first joined the Army. Just beautiful! The entry had a big winding staircase. Why can't we keep the old great buildings? Why do we have to replace them with parking lots, or cheaper, buildings that all look alike? In San Diego, it seems that the popular architectural style is a combination of "Mediterranean" and "Craftsman". And the materials? Stucco covered cardboard looking walls with lots of aluminum and glass with ornamental wood berbers and stone facades. Very temporary looking. The stone fa cads and steal window bars look more solid than the whole building. My Grandma May used to call that "Progress". This is a woman who used to take us on Field trips to places they once lived that have been turned into parking lots! Progress my eye! It has been at least 35 - 40 years since I had my last glass of Moxie. In all that time my taste buds have had absolutely no cravings or desire to sample it again. Now, through the power of suggestion on this board, it is on my grocery list and something I "must do" before the time comes for me to shuffle off into the sunset. So on my next trip to the supermarket, I will meander down the "soda pop" aisle (or tonic aisle as we are wont to call it here in the northeast) and see if they carry the stuff. Wonder if there is a diet Moxie these days? laughland, I just love that cwazy wabbit! Never realized the Groucho connection. Gregory: The elusive Dismuke appears in the last photo of the Waco series. You must have missed him. Ian: Love what you did with the photos. 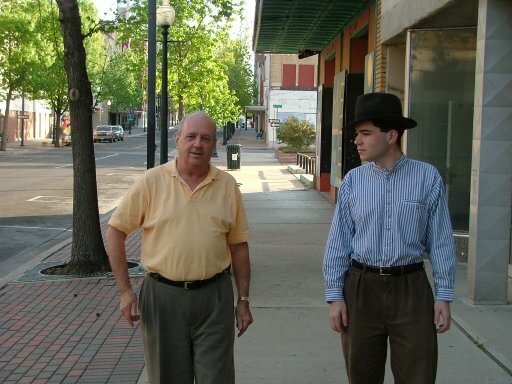 Having Eddie the Collector taking the place of his Dad and walking down that street in the '30's is incredible. I CAN'T WAIT 'til you come back from your tonic shopping ... I'm dying to know what you think about Moxie after so many years. I somehow remember it tasting like carbonated prune juice -but, who knows? -maybe you're right -maybe it really does taste like fountain pen ink! The Moxie Caper is something I am now driven to do, as it is imperative I experience that distinct inky flavor one more time. If it kills me, my only request is that you have the little jingle I mentioned inscribed on my tombstone. It will be little to ask since you and Dismuke will be held responsible for my demise for bringing the name Moxie to my attention again. Pronto-Lax, eh? I can only imagine what that would do to this old bod!!! Wait a minute... Take a closer look at that Hippodrome Theatre in Waco. Is that what I think it is painted on the side of the building? ... 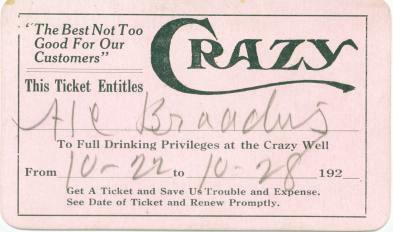 Yes, it looks like it might be an old "Drink Friz!" sign..."
In both cases, Poor Friz is cut off in the picture! Gregory - you haven't looked carefully enough. For the very first time (as far as I know) Dismuke IS appearing in one of his photos: he's to the left in the last of the Waco photos. Ah! I miss read the blurbs in a hurry... I was reading the line above it and confusing the two! Yay! Somehow a DJ's Voice never matches up with my imagination's version of their looks! I ordered a bunch of interesting sodas from the Soda Shop site and just recieved them in the mail today. Out of curiosity, I choose the Moxie first, after they had been refigerated for a while. When taking a big swig of it, the taste is phenominally good, but that is quickly replaced by a nasty, bitter aftertaste that lingers for a minute or so. Drinking one of those produces one heck of a dilemma for the taste buds. 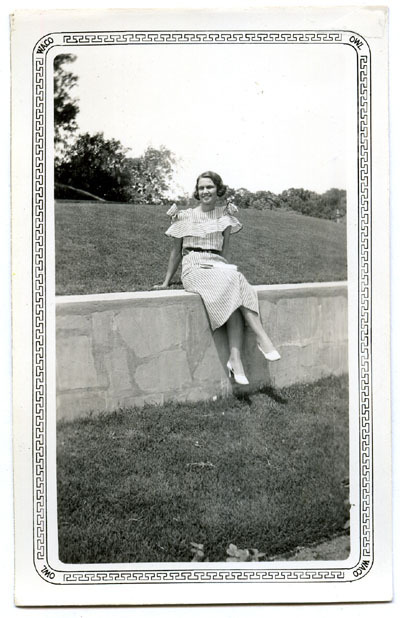 I've enjoyed Gregoryagogo's photos of his grandmother to the extent that I've decided--ME TOO! PS I owe a tremendous debt of graditude to Ian House who helped me load these--I know most of you are familiar with these things, I'M NOT!!! When taking a big swig of it, the taste is phenominally good, but that is quickly replaced by a nasty, bitter aftertaste that lingers for a minute or so. Drinking one of those produces one heck of a dilemma for the taste buds. Yes! That's the common reaction and the exact same one that I had at first. Just wait and see, however. Before you know it, you will be positively addicted to the stuff and will actually start to crave that bizarre after taste. Congratulations! You have been Moxiecuted! Congratulations! You have been Moxiecuted! Jarred is in the hospital? Gee - I've got something that will have him up and RUNNING in no time! Use Pronto-Lax -when Crazy Crystals just aren't enough! You are correct. Pronto-Lax is much better than Crazy Water Crystals. Yes, Moxie lives! Not only in our childhood memories but on grocery shelves throughout New England. And, yes, Virginia, there is a Diet Moxie! I picked up a bottle last week and I am 99% sure they have changed the formula since I last tasted it some 35 - 40 years ago. The flavor has changed substantially and now has the flavor of glorified rootbeer. Bitter taste? What bitter taste? Not near as bitter as it once was. I actually enjoyed it and think I just might pick up another bottle the next time I shop. Dismuke, I do believe the Pronto Lax must be 100 proof by the look on that man's face after taking the prescribed dosage. The Crazy Crystals sure remind me of the "Clean-out Kit" the doctor had me pick up at the pharmacy the last time I had a colonoscopy or some such test. Great Stuff. Guess it does just about everything a body can ever hope for. 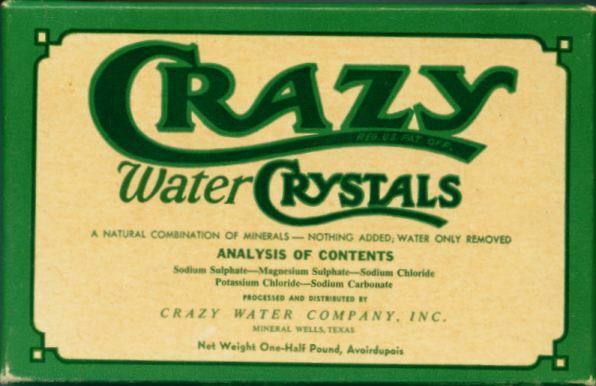 -when Crazy Crystals just aren't enough! 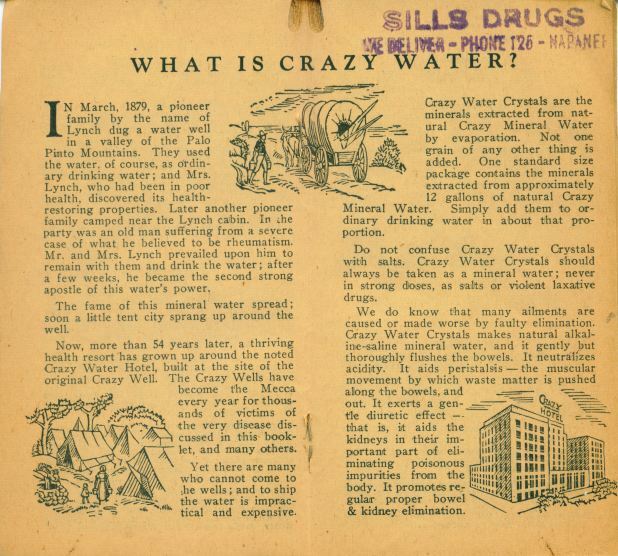 Since the Famous Mineral Water Co. is still in business, I have one question in regard to their product line. 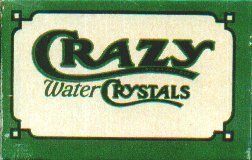 It would seem that the company has gone through a "reverse osmosis" to remove all of the historical branding icons such as "Pronto-Lax" and "Crazy Water Crystals" ... What ever happened to Pronto-Lax? When did they stop selling it? Perhaps these brands died with Mr. Dismuke back in 1957... 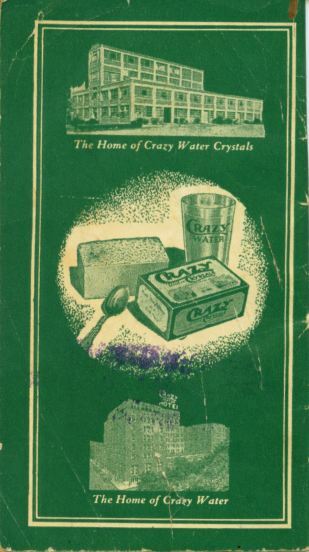 I notice that the Crazy Water Crystals are still being sold in the form of a beauty aid, the Crazy Crystal Body Scrub at the bottom of this page. 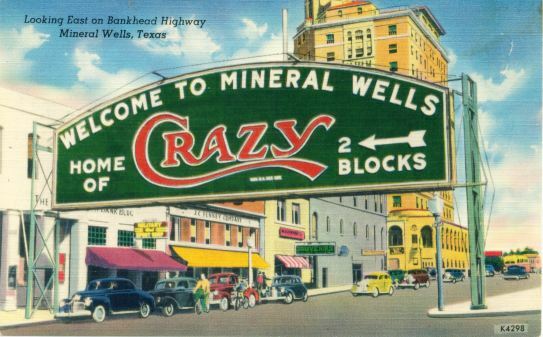 Perhaps your next photo journal trip could take us to Palo Pinto through nearby Mineral Wells. Palo Pinto has a special place in my heart; Still standing, the first Christian church building (1882) was established by one of the most prominent founding citizens of Palo Pinto County, Dr. Stephen Slade Taylor. The above photo from May 31st, 1890, shows members of the Taylor family standing in front of the church. Dr. Taylor's 6th child, Pleasant John Taylor grew up to inherit the preaching duties at the church... but due to the conservative traditions of his congregation (no loud singers or foot-stompers need apply), he packed up his musically inclined family and took them to Idaho (where religious folks appreciate good fiddle playin' :-) In 1897, Pleasant (aka "Pleas") and his wife Olive (aka "Ollie") gave birth to their 9th child, Lena Corinne Taylor (aka Lee Morse) ... so I would argue that the clear and pristine singing voices of the entire Taylor family must have owed something to the natural resources of Palo Pinto County. As they say: There must have been something in the water :-) Crazy! Click here to listen to "Moonlight and Roses"
Love the pics of you mother, Eddie! She is so free and natural sitting on that wall! Very devine! Thanks, Gregory--after all, it was the wonderful pics of your grandmother that inspired me to post them--then Ian had the idea of doing the Moonlight and Roses tribute. The important thing is you appreciate what treasures you do have! And preserve them in an organized fashion so you don't loose them! When I think of the times when I moved, and moved again, and the pics ended up scattered and thrown in boxes... The fact that they survieved not only my terror, but that they survived this longat all, is a miracle! This scanner is the best think I baught. It is a full time job scanning and orginizing the many chapters of my life and my family's. I just love the pic of your Mother on the wall! I love it as much as pics of my Grandma. Pictures like this radiate something Devine. Not only women had to be smart and efficient and work hard, but they had to do it in style and grace. I think there is an inner model in all of us. She is sitting on that wall like she is a star! Yes, I have had the Moxie without any medical complications whatsoever. Today, I moved on to the Birch Beer, and I must say that as a person who has never had the need to take Pepto-Bismol before, the birch is actually mighty tasty. I'm sure I'd have had the opposite reaction had I experienced the PB before. It's a shame the makers of PB had to go and ruin a good product like that, by using a good flavor for such a negative experience. Heck, just replace Pepto- with A-. A-Bismol, Abysmal! Who wants to drink that, at any time? I'm thrilled to hear that you have survived the Moxie! ... Did you get the Boylan's Birch Beer? ... I've never needed Pepto-Bismol before either so I haven't a clue about what it tastes like -do you think it might have some sort of wintergreen flavor? Thank you very much for the posting of your pictures of Waco and of the guys. Roscoe was one of the best . By any chance , has anyone here read "I Fatty" by Jerry Stahl ? It's a fictionalized account of Mr. Arbuckle's tumultuous ,( yet very rarely talked about in light of the scandal) but very successful career he had. It's a good summer read and I'm sure many of our fellow Dismukers here would enjoy it , as well.